The TOTT kit starts with a Condor organizer that may be perfect for Geocaching. Inside, the tool kit features some of the best tools in the known Geocaching world. The Magnigrip Tweezers gets you out of tight spots and helps to see the tiniest of codes. The telescoping Mirror/Magnet tool gets you a look into places that no Geocacher wants to touch without looking first. The Geoknots Logsheet Roller is the best in the business to get the logs back into the nanoest of hides, and the All-Weather Tank Pen will sign that log from the desert to the mountain tops. What goes next into the kit? You decide how to fill out the rest. 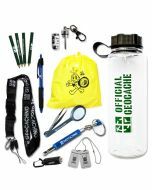 Looking for the best gift for a Geocacher? We think you found it. Looking to treat yourself? We think you deserve it.